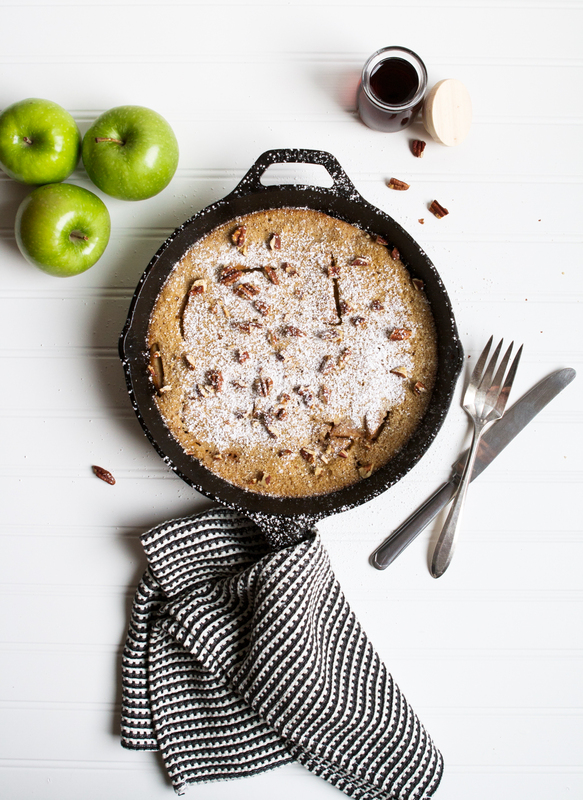 This puffed apple pancake is a healthified take on the classic German pancake, often referred to as a Dutch Baby. 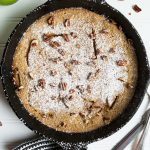 Although this version isn’t as thin and egg-y as a Dutch Baby, it definitely marries the qualities of a pancake and a popover. 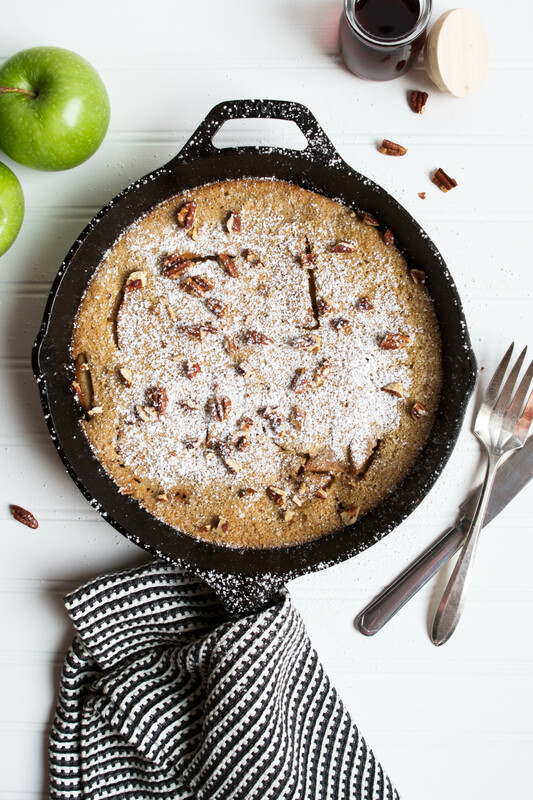 It’s crisp and golden on the edges, slightly custardy in the middle, and layered with perfectly cooked spiced apples. 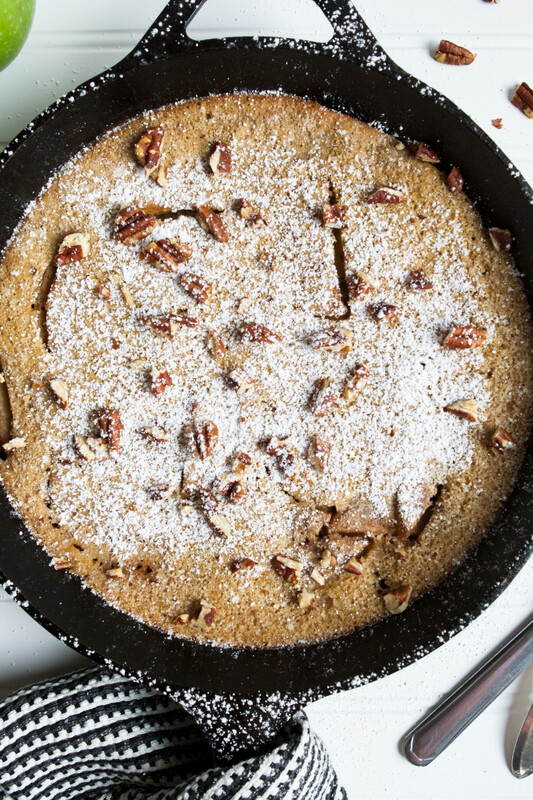 This pancake is a lovely fall upgrade to your usual breakfast menu. The wonderful ladies Rebecca and Ruth, from Square Meal Round Table and Annie, from What’s Annie Eating, invited me to their 3rd seasonal food blogger collaboration. Their first two collaborations spotlighted peas and peaches, and this time around they’ve chosen to feature apples as their fall ingredient. Although there is a lot of incredible produce available during fall—sweet potatoes, kale, pears, pomegranates, cauliflower, squash, pumpkin, and brussels sprouts—there’s just something about a really good fall apple. I love Honeycrisp because, well, they’re sweet and crisp. But I also adore a good Granny Smith for their tart, refreshing, and hearty nature.They’re especially great in slaws, salads, soup, and of course breakfast dishes. What’s your favorite type of apple? And how are you cooking with them this fall? Whisk together flour, 2 tablespoons ground coconut sugar, and salt. 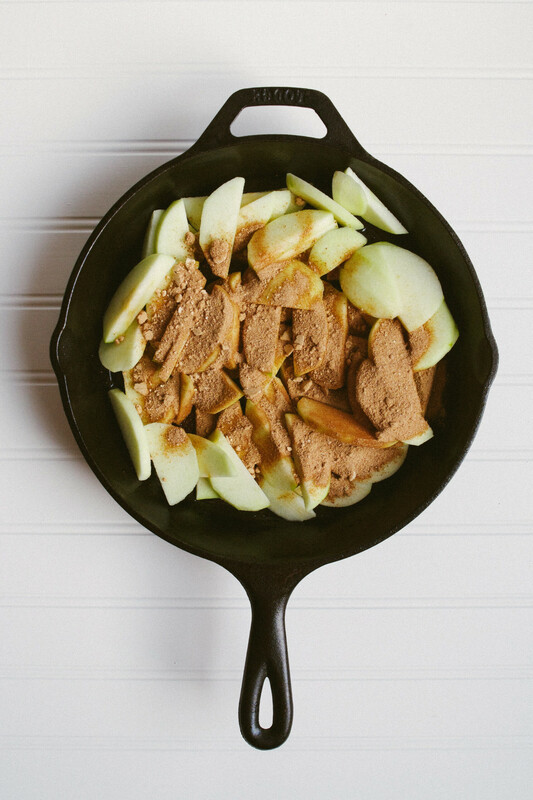 Heat oil in a 10-inch cast iron skillet over medium-high heat, add apples, remaining ground coconut sugar, cinnamon, ginger, and nutmeg. Cook apples, stirring frequently, until starting to soften and caramelize, 5 minutes, scraping up any caramel from bottom of pan. Off heat, stir in lemon juice. 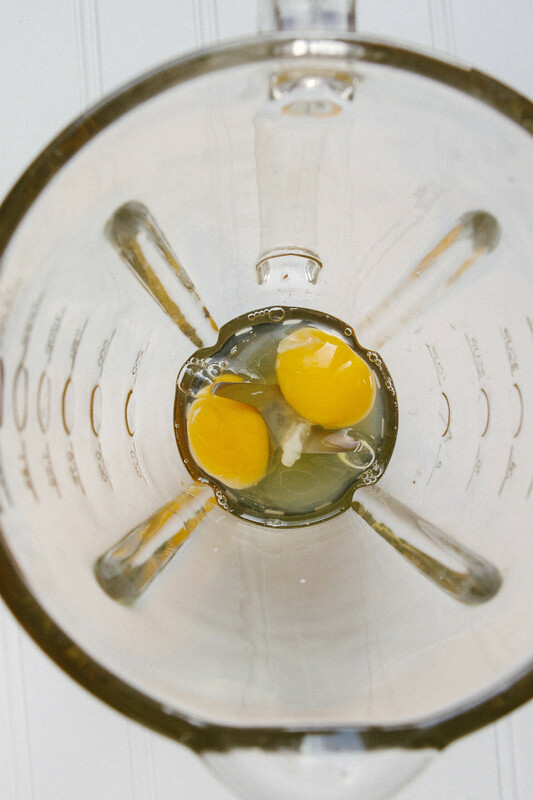 Working quickly, blend eggs in a blender until frothy, 1 minute. 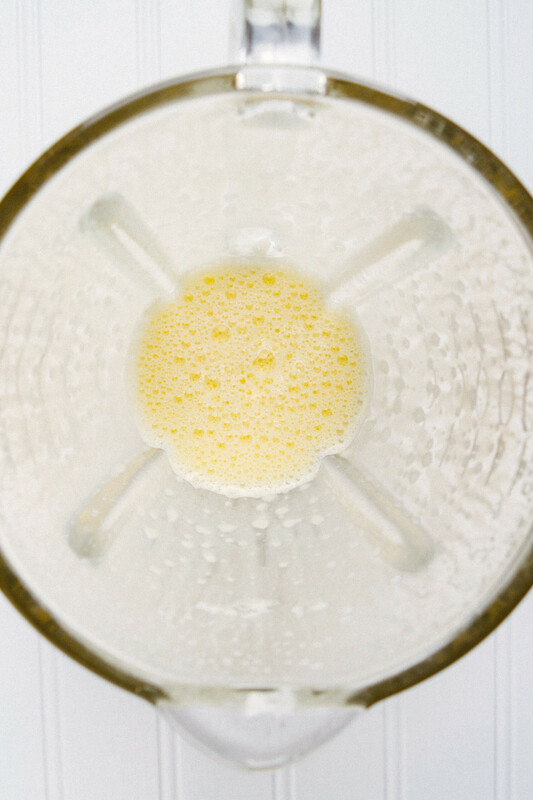 Whisk blended eggs, milk, and vanilla into flour mixture until completely combined. 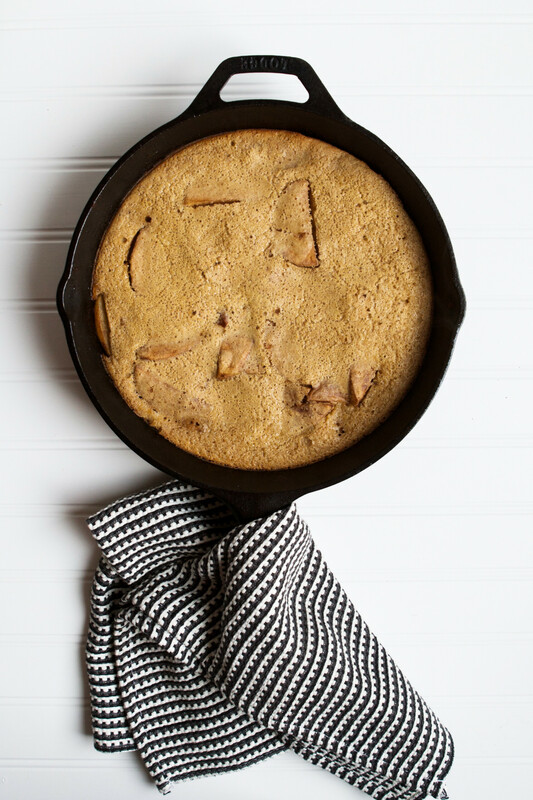 Pour batter around and over apples in skillet, transfer skillet to oven and immediately reduce oven temperature to 425°F. Bake pancake until edges are slightly puffed and golden brown, 18–19 minutes. Remove pancake from oven and let cool slightly. 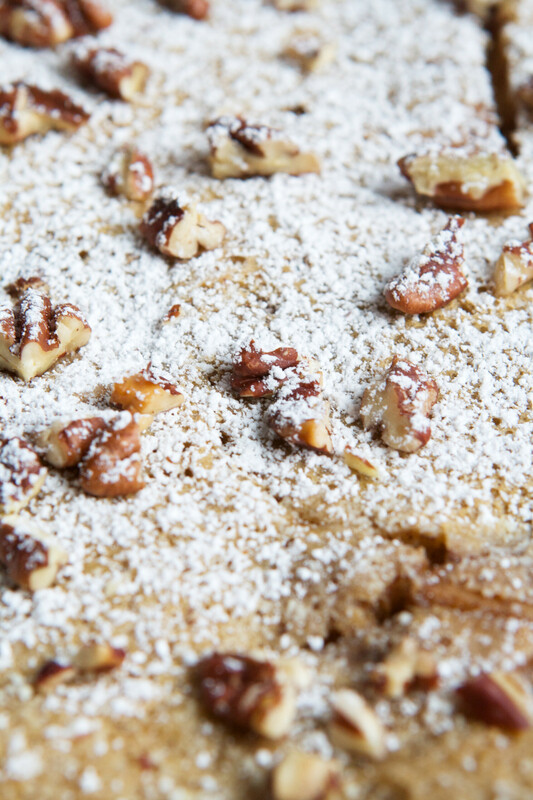 Dust pancake with powdered sugar, sprinkle with pecans, and serve with maple syrup. For the best results, be sure to grind your coconut sugar before using. Coconut sugar is very granular, and if it’s not ground it will cause the surface of the pancake to looks splotchy. Grind the coconut sugar in a spice grinder, and if you don’t have a spice grinder, do your best with a mortar and pestle. If you’d prefer to skip the grinding step, simply use brown sugar instead of the coconut sugar. 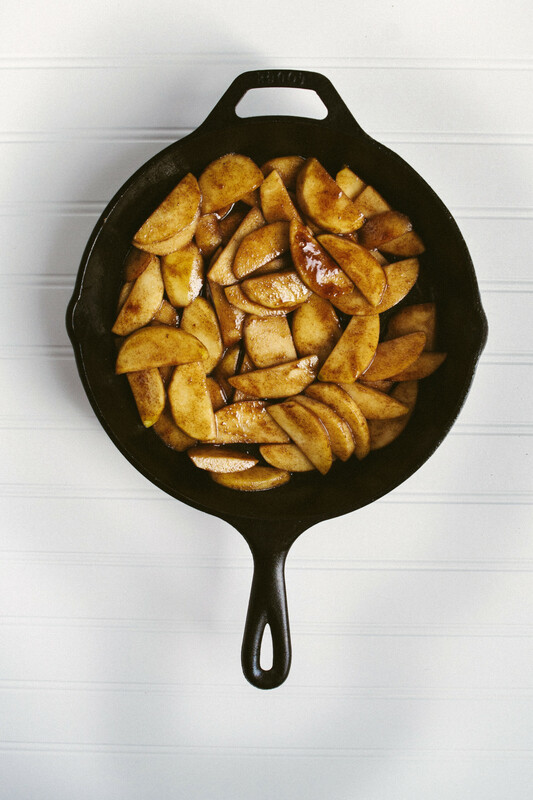 Use 2 tablespoons brown sugar in the flour mixture and 3 tablespoons for sautéing with the apples. 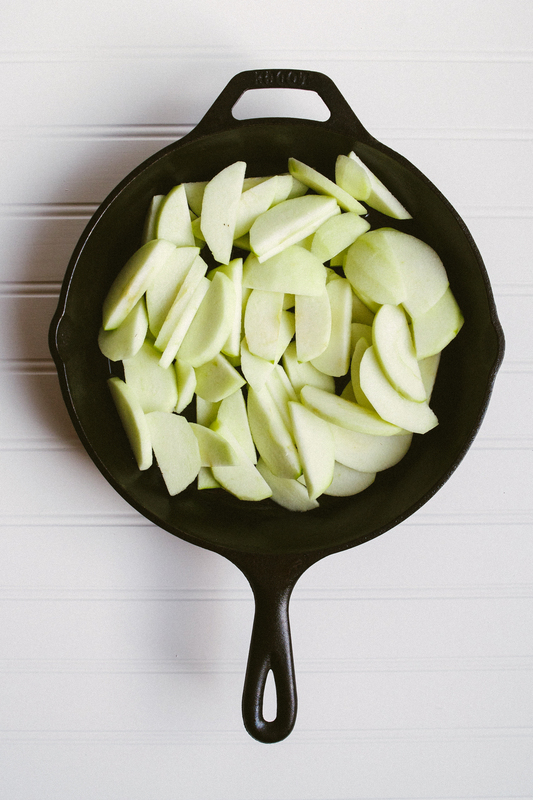 The acidity of Granny Smith apples can cause damage to fairly new cast iron pans, so be sure to use one that is well seasoned and has been used quite a bit. 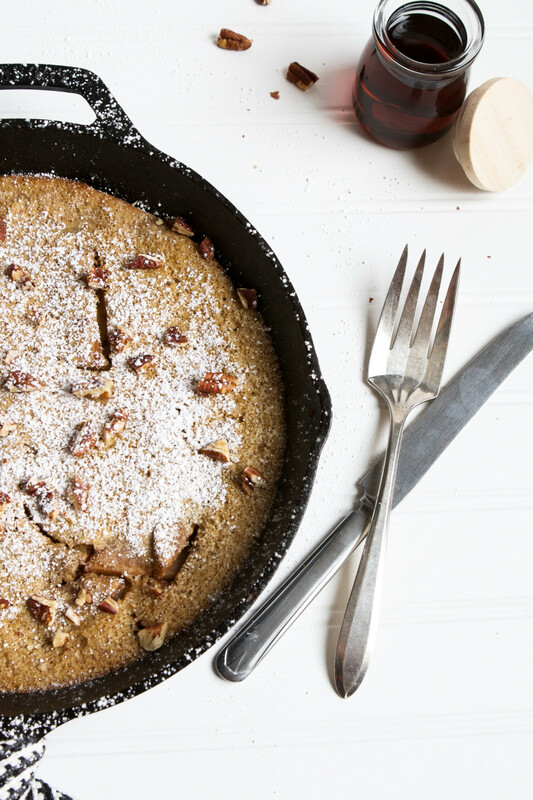 If you don’t have a well-seasoned cast iron skillet, an ovenproof nonstick skillet also works well. To achieve the right texture, be sure to use large eggs. Extra large will cause the pancake to be too custardy, and medium or smaller will decrease the amount of rise you get, making it less puffy. 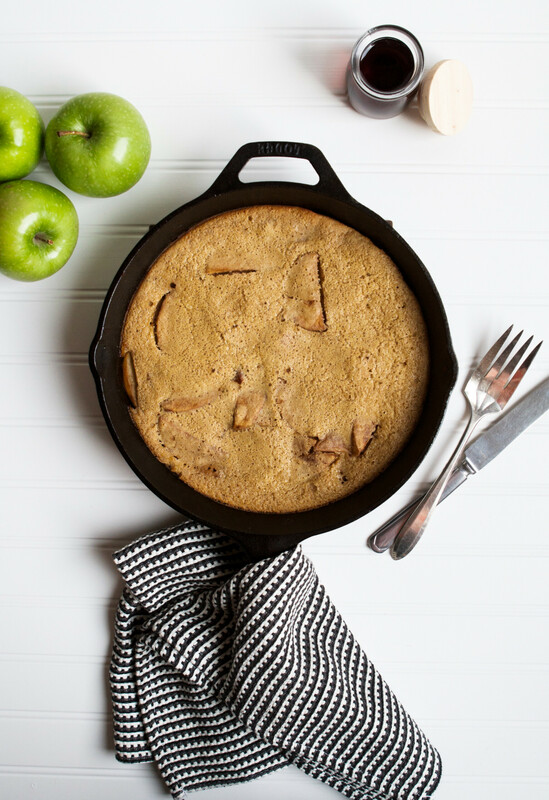 Check out these other bloggers and their apple creations, or find some inspiration on Instagram using the hashtag #aisforalltheapples. If you’re whipping up some ZK recipes in your kitchen, snap a photo and share on social media with the hashtag #zestfulkitchen. I’d love to see what you’re cooking up! 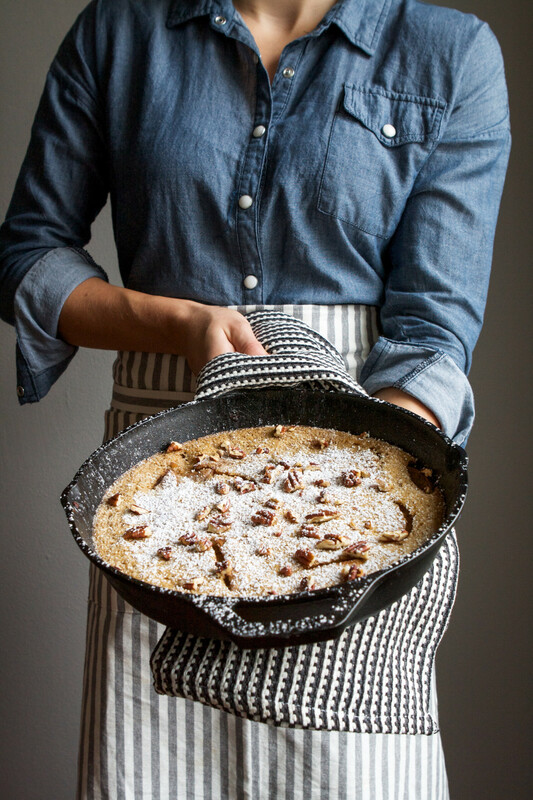 This looks so amazing and would be the perfect fall breakfast! 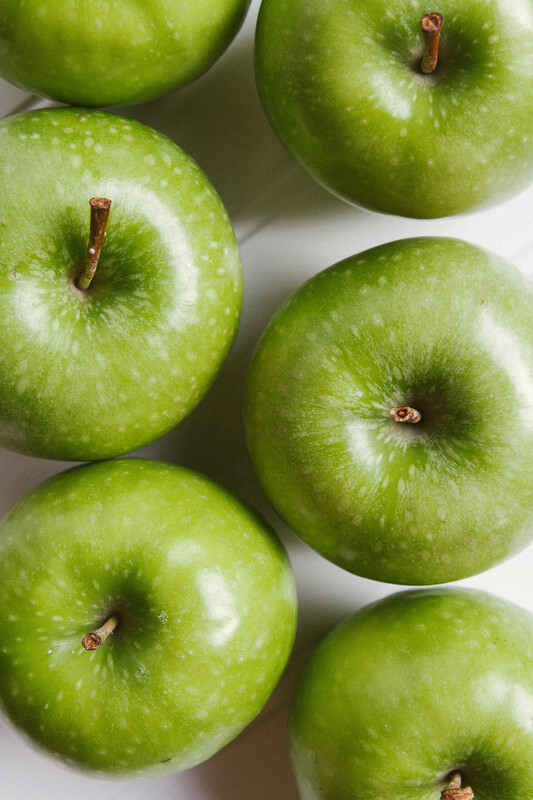 I’m a huge fan of anything with green apples and you’re photos are gorgeous! I can’t wait to try this recipe. You have a new subscriber! 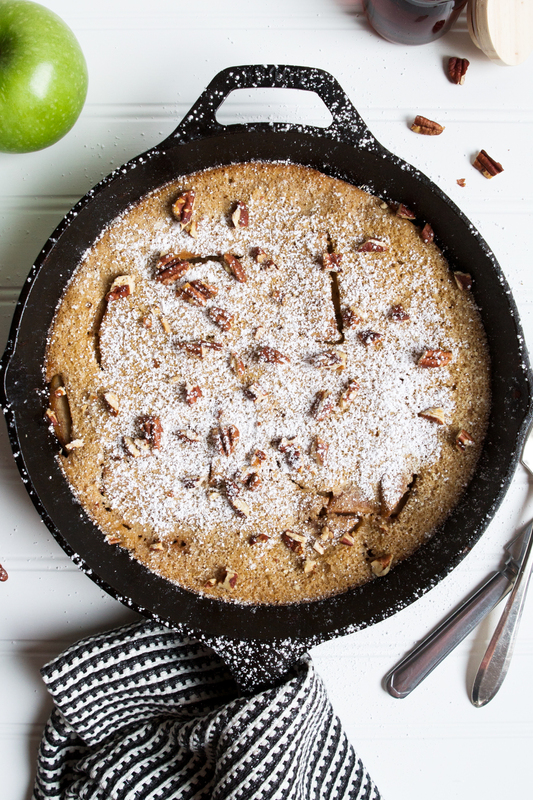 What a wonderfully wholesome Puffed Apple Pancake! It came out beautifully just like the photo! I loved the apple, cinnamon, ginger, and nutmeg combination with lemon juice… reminded me of apple pie, yum! I made it twice in the same day! This one’s a keeper, thank you, Lauren! You are amazing!